Lately I've been working on the enemies AI. It's a simple state machine and the enemy is able to punch, jump and stand up. A hit to the head, if strong enough, is enough to knock them out. This is my first fight againt the AI. The logic for this is very simple. I've been playing this game for 2 years now, if i'm having troubles making the character do some action, how are new players goign to manage at all! Level 5 was a big problem. Too much to do, you need very good control, and to be honest not a very good incentive (clean a kitchen). So yeah, it had to go. Now it's just 2 challenges, one very easy, the other one medium; that once you know the solution it's gonna take some fiddling but you should feel good when solved. I'm not completely sure about today's changes. Testing with the new demo (v0.6.2) will have to show the final conclusion. * Tutorial was slightly improved. 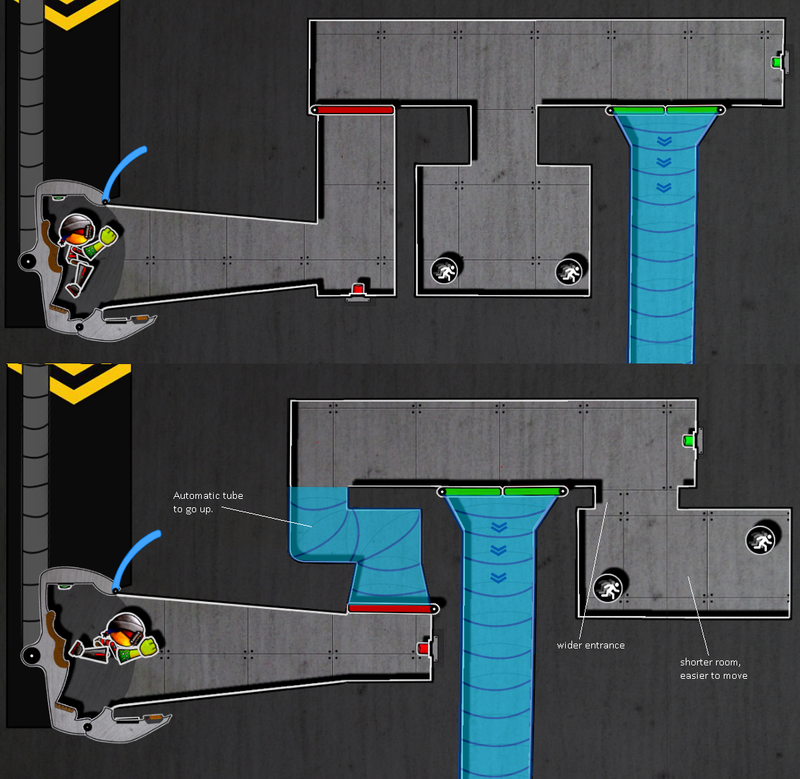 * A vacuum tunnel was added to avoid the player the trouble of too much displacement. * Teh entrance to the "pro" area was widened, and the room shrank to make movement easier. 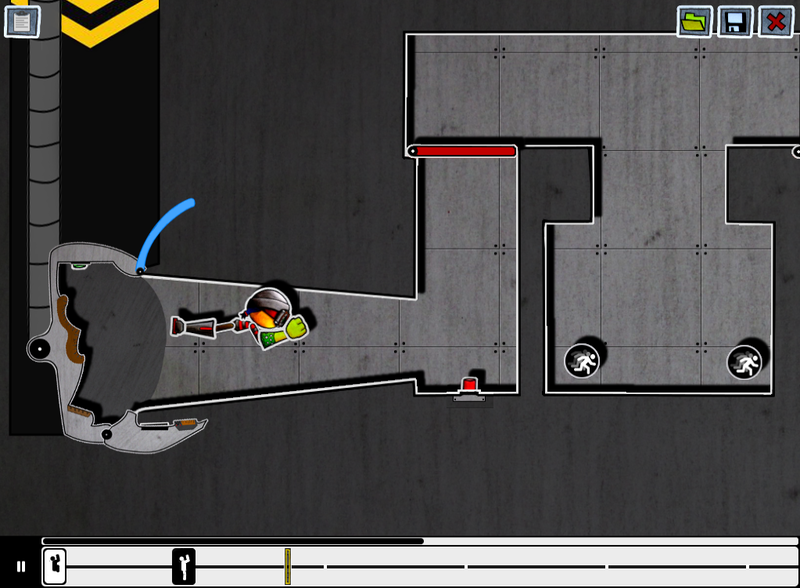 Today it was the level's 3 turn to get some small polishing to make the objetive and control clearer. * A red cable links the button to the marker. * The marker is now bigger and clearer to point out the current active color. * The arrows were made bigger to tell the player what each pedal does. Based on some feedback, I've been working on the first and second level. * The wording of the mission briefing made people believe that they had to get out of the pod. 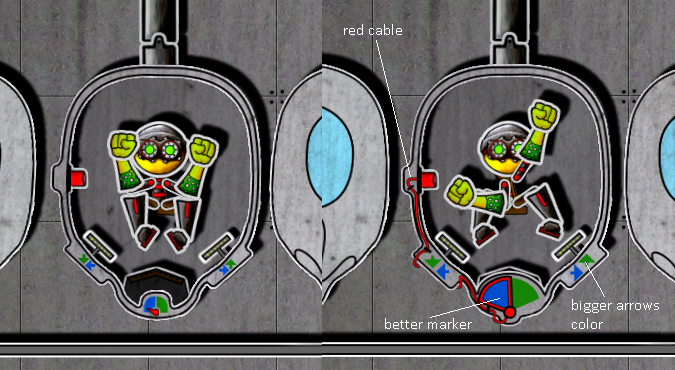 This was fixed not only by rewriting it but by attaching the character with a seat bealt to the pod. * The pod was simplified by removing the controls from the outside of the pod, into a separate deattached panel. Since the original configuration seemed like the pod was actually closing rather than opening. * Some coloring relations were set up to let the player know what controls work together. * The pedal use to be too close to the hand, and somewhat pushable by it. Now was moved to the bottom of the pod, the hand can no longer reached it (by a significant distant) and the fact that you have to use your foot should be pretty obvious now. I've been working on a new demo, with 6 new levels. Actually the first two are pretty much the same in a new setting, but the other 4 are new based on some feedback I've received from testers. The biggest difference right now is that the game begins in space, which means that gravity is no longer an issue as the user in getting used to player control. I truly believe this will make the player more comfortable with how the character moves before the complicated levels come. 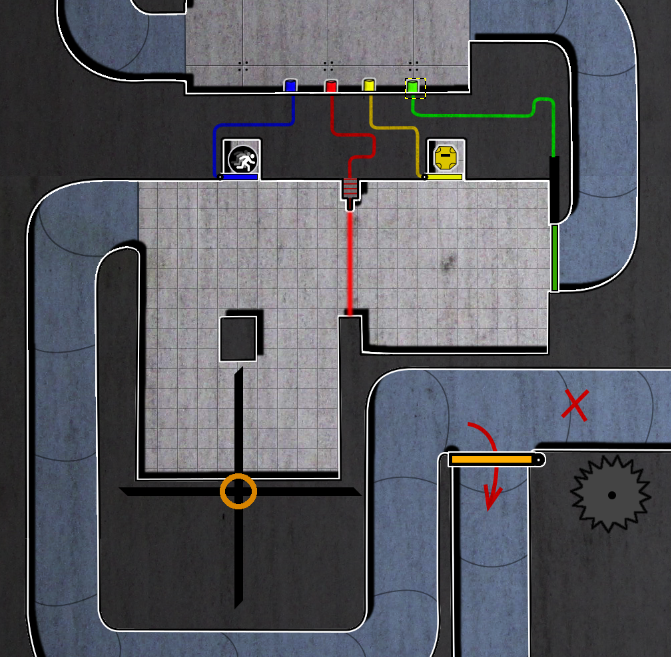 On a different note, I've added a few details, like "Pro tokens", which are placed in difficult locations and are optional for the players that want to show how well they can manoeuvre in the levels. Before there was no motivation to take the high road.